Similar to match 3 games but with a fun and simple style of gameplay. 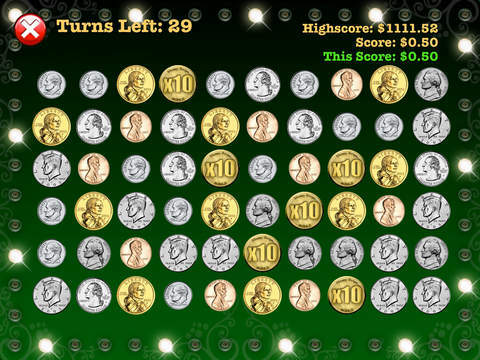 Match the money symbols and score high points! 'Classic Grab' version included, with the option to purchase additional game modes. Plan your strategy to save your last move on all the high values, or just swipe all the pairs. Occasionally, a WILD x10 symbol will appear but use it wisely on the high values. After each game, your score is saved on a local High Score list & global leaderboard Game Center™ for you to compete again the next time. Sharp graphics and fun music, you can play over and over. Also supports the ability to play your iPod music. 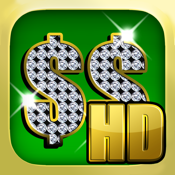 4 Game modes: Classic Grab, Timed Grab, Money Stash & Fast Cash. 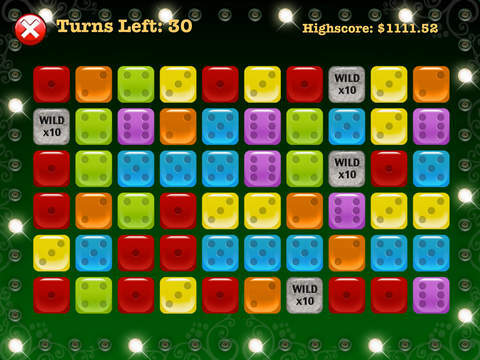 • Classic Grab: 30 turns of this classic game will have you planning your moves carefully at your own pace. • Timed Grab: Score as much money within 5 minutes. • Money Stash: Eliminate all the money at your own pace. Concentration and careful planning will help achieve a High Score. • Fast Cash: The money is disappearing so act quickly! Try to match up the high values within 5 minutes. • Upgradeable Art Pack which includes 10 additional dice. 20 Game Center™ Achievements to unlock! Legal Disclaimer: MONEY SWIPE is for entertainment purposes only. All money is simulated winnings. In no event shall Big Smash Studios or anyone affiliated be responsible for payment of simulated winnings.